BT has the highest level of broadband complaints in the country, according to new figures released by Ofcom. The industry regulator said 33 out of every 100,000 BT customers had complained about their home broadband service. 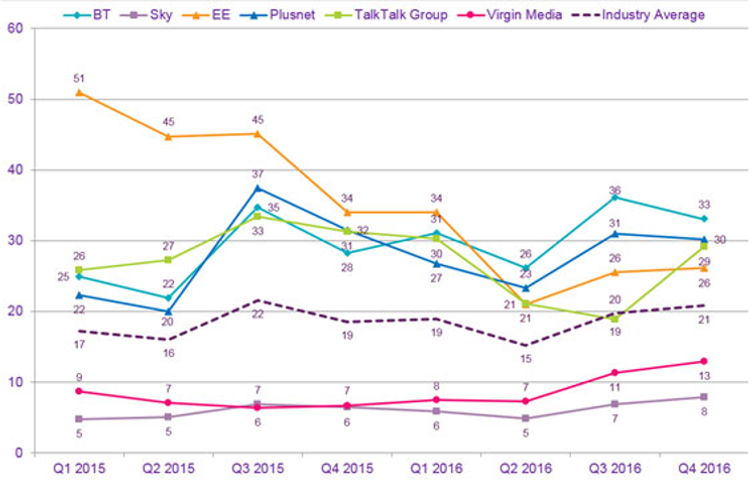 Two other major providers also owned by BT – Yorkshire-based Plusnet and mobile phone giant EE – fell into the top-four most complained about brands. The report put out by the regulator covers the period from October to December 2016. A contrite BT apologised profusely in the wake of the embarrassing figures. The multi-billion pound company was recently hit with a record £42 million fine for delays over installing broadband. BT said it was now better at tracking broadband complaints as it had installed a major software upgrade for its call centre advisors. “Customers will see an improvement as these initiatives take effect,” said the spokesman. The report also reveals some rather interesting facts. EE began 2014 with a staggering 51 out of ever 100,000 customers making formal complaints about their home broadband. It rallied to pull that figure down to 21 in 2015 but complaints have been steadily increasing since then. Sky Broadband scored the best result in the Ofcom list with just eight out of 100,000 customers complaining about their home broadband. 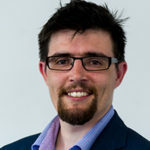 A jubilant Sky told BroadbandDeals.co.uk: “Sky has generated proportionately fewer Ofcom complaints in broadband, talk and TV than anyone else during the past year, but we always set ourselves higher standards. Complaints were up a fraction of a percent from seven in 100,000 in the last Ofcom report. 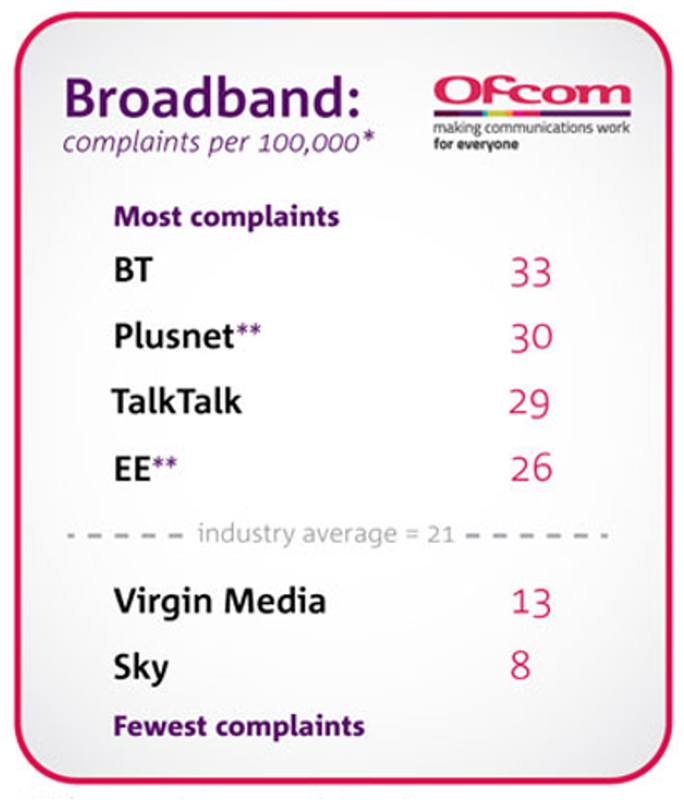 But the numbers don’t lie: Sky Broadband is well below the industry average when it comes to broadband complaints. Virgin Media also scored well. 13 out of every 100,000 customers putting in a complaint means the British firm sits second-best in the the table. Broadband and landline phone services are still generating the highest volume of complaints across the industry, said Ofcom. BT was recently forced to cut its landline bills by a minimum £5 a month. And it agreed a March 2017 deal in with the regulator to legally split from its engineering arm Openreach over fears about competition in the sector. Lindsey Fussell, Ofcom’s Consumer Group Director, said: “Providers must get on and deliver consistently excellent customer service, and we expect this to be their number one priority.